Going on a holiday or a long journey always tempts me to fill my hand luggage with easy to read magazines. It’s a guilty pleasure for lots of us I think. Previously in addition to the magazines my hand luggage will contain my iPad, iPhone, a packet of baby wipes (useful for just about everything), sweets, lip balm, bottle of water and the odd toy for Erin and her inhalers. Even if she is not with me I usually still have Erin’s stuff in the bottom of every bag I own! Interesting fact of the day is that according to John Lewis the average women has £1300 of stuff in her handbag and cost of handbag. Add in my little bundle and I am not actually far off that figure. Last week saw me going away without the kids. It was going to give me plenty of time to read. But those magazines take up space, are not very environmentally friendly and the cost soon creeps up. 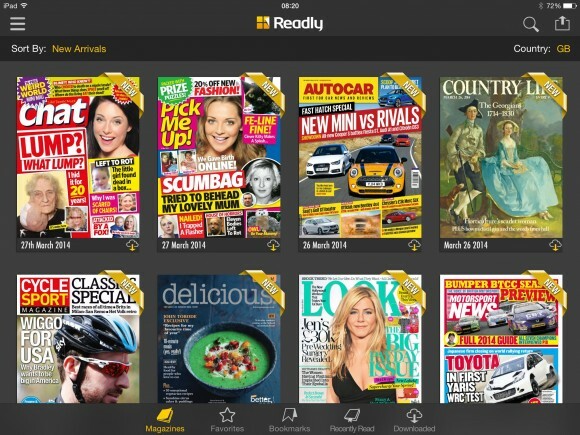 I had been offered the chance to try the new app Readly which means that you can download magazines like, Now, Chat, Look and other such magazines. The app allows you to get past and current editions. It doesn’t just cover women’s magazines there are a host of sporting titles, home interiors and kids titles like the Beano and National Geographic. The app has a two week trial so I suggest trying it out and downloading your favourites. If you like it ( like I do) it will cost £9.99 per month which I think is excellent value for money if you are a regular magazine buyer / reader. The app can also work on five devices for one subscription fee which I didn’t try out but seems another good feature. The technical stuff is that it downloads really quickly and can be done using wifi and / or 3g. I was able to download more magazines whilst in a bar for my journey home. I will certainly be using this app again.